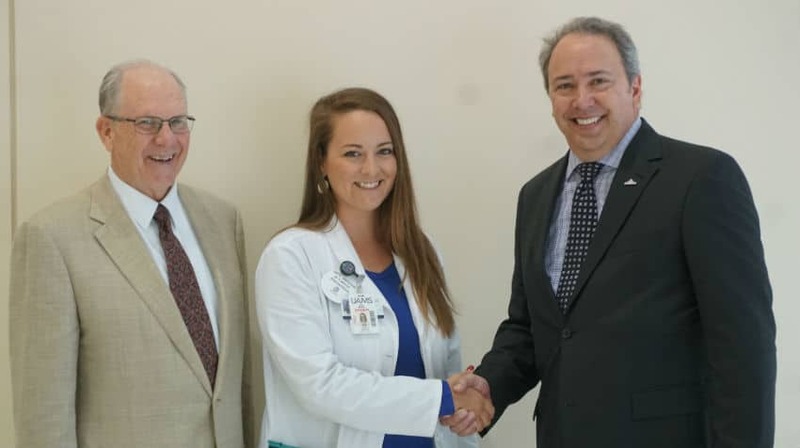 Third-year medical student Zoe Weeks (center), flanked by UAMS College of Medicine Dean Christopher T. Westfall, M.D., shakes hands with Corey Little, president of Arkansas Mutual Insurance Co.
Sept. 21, 2018 | Sept. 21, 2018 | Zoe Weeks of Jonesboro has been awarded the $10,000 Arkansas Mutual Medical Student Award, a scholarship for third-year medical students at the University of Arkansas for Medical Sciences (UAMS) who want to practice primary care in rural Arkansas. Weeks, a graduate of the University of Arkansas at Fayetteville and the University of Missouri-St. Louis, first pursued a career in teaching and decided to switch to medicine after spending a summer in the Delta and seeing the health care challenges there. Weeks plans to return to northeast Arkansas to practice either family medicine or pediatrics, particularly in one of Poinsett, Craighead or Jackson counties, where her family is deeply connected: her father is a produce broker, her mother is an agricultural entomologist, and her husband is involved in rural agriculture. “I am very passionate about rural development, particularly in the Delta, and believe that health care access expansion is critical to the future success of our community,” Weeks said. Corey Little, president of Arkansas Mutual Insurance Co., the only medical liability insurance provider headquartered in Arkansas, said the company continues to commit its resources to improving rural health care in the state.